Saturday, May 10, 2014, 9:00 a.m. Thanks to runners like you, this series has raised over $126,000 for King County Parks and contributed many hundreds of hours of trail work. Join Seattle Running Club and Northwest Trail Runs in carrying this legacy forward and making this 12th annual event bigger and better than ever! 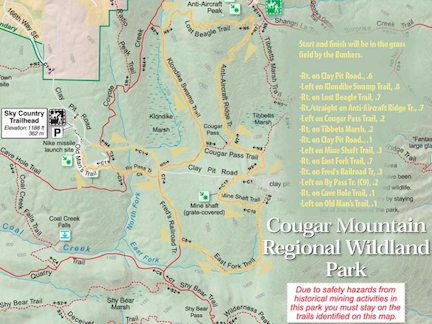 Just 15 minutes from Seattle, King County's Cougar Mountain Regional Wildland Park, is a trail running paradise thanks to its rolling and runnable hills and trail variety ranging from narrow and technical to wide and groomed. Run through lush forest, fern-lined single-track, over hills and along marshes, just minutes from the city. Want to keep going? We'll return to Cougar on Sunday, October 26 for a 7.6-mile, 20-mile or 50k! These events fill up quickly! Registration is available online, by mail, or in-store at The Balanced Athlete in Renton or at Fleet Feet Sports Seattle. Online registration deadline at 5pm the Friday before the race and mail-in deadline one week prior to race. Day-of-event registration for an additional $10 for short course, $15 for long course, and $5 for 5k. Check out the video preview of the 5-mile loop HERE! The single 5.14-mile loop starts and finishes at Sky Country Trailhead. The course begins heading up Clay Pit Road and shortly connects with a mix of wider and moderately hilly single-track trails. Although not highly technical, the course does involve negotiating logs and potentially unsteady footing over rocks and roots. The course is slightly muddy in areas, but the majority of the trails are in great shape and very runnable! There will be one aid station around mile 3 that will provide standard trail run snacks--cookies, gels/chews, fruit, candy--water and electrolyte drink. Click for a large view.